A Palestinian man shot dead Sunday after waging a terrorist attack that killed two people in Jerusalem and wounded five others was hailed as "the Lion of Jerusalem" and a martyr by an official with the Council on American-Islamic Relations (CAIR). 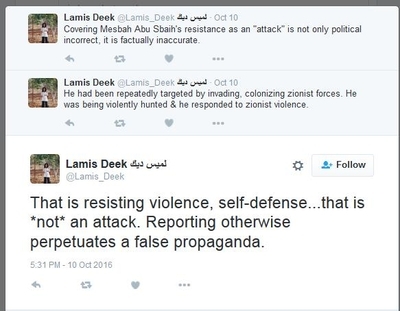 Mesbah Abu Sbeih, 39, engaged in "self-defense," Deek wrote Monday on Twitter. That is "...*not* an attack. Reporting otherwise perpetuates a false propaganda." 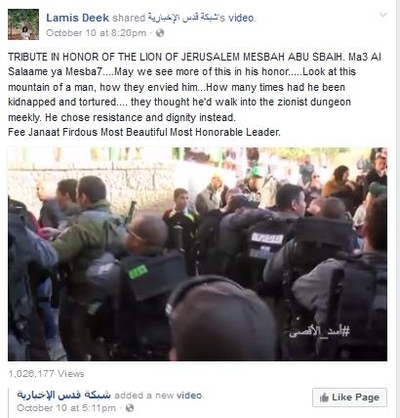 As we have shown, this kind of glorification of violence, when directed at Israelis, is consistent for Deek, an attorney who serves on the board for CAIR's New York chapter. She has called Israel "the genocidal zionist regime." In this case, she reposted a video tribute to Sbeih on Facebook, describing him as "this mountain of a man, how they envied him." The video shows footage of the shooting attack and its aftermath, including a Palestinian taping on his cell phone from a distance shouting, "Allahu Akhbar." Deek's organization, CAIR, has roots in a Hamas support organization in the United States created by the Egyptian Muslim Brotherhood. Witnesses and documents establish these connections, but CAIR officials refuse to confront the issue directly. Deek is joining a series of Palestinian groups and people in canonizing Sbeih. A Palestinian soccer team posed with a photo of the terrorist hailing him as a martyr and hero. Giant posters displaying his image appeared on buildings. The Palestinian Authority called for a general strike Sunday to honor his "martyrdom." Sbeih was supposed to begin a four-month jail sentence stemming from a 2013 assault on a police officer. "[T]hey thought he'd walk into the zionist dungeon meekly," Deek wrote. "He chose resistance and dignity instead." A 60-year-old woman, Levana Malihi, was one of the victims of this act of "dignity." He killed an innocent woman. Deek offered one wish for his legacy: "May he live forever a thorn in the eye of every zionist colonizer and hostage taker," she wrote.